This case comes from a long term blog reader from Norway. Case: 49 y.o male. No previous medical hx. 15-20 pack year smoking history. Parent with ACS in their 60's. No DM. No HTN, no dyslipidemia, normal weight. 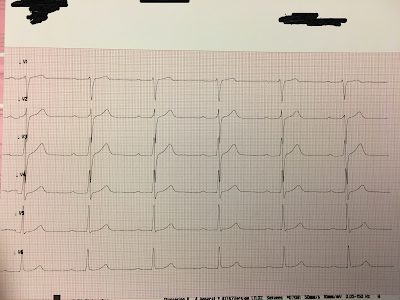 Brought to the emergency department due to chest pain. 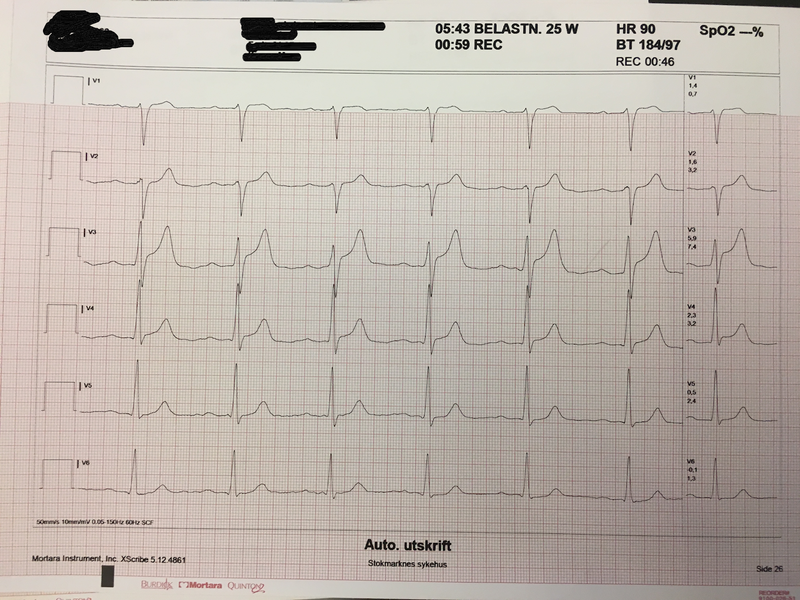 Patient stated that 20 hrs before presentation he experienced numbness of the left hand, 1-2 hours after which he developed retrosternal chest pain ongoing from 02:00 lasting until 08:00 with no pain free period. Went to bed at 08:00. Awoke 11:00 pain free. The day of presentation, the chest pain started again while doing light physical work. Pain free upon admission after NTG, 300mg ASA and morphine 2.5 mg given prehospital. I (Smith) am excluding limb leads as they do not add much and take up too much space. Note: this is recorded at 50 mm/sec, the way they do it in Norway. 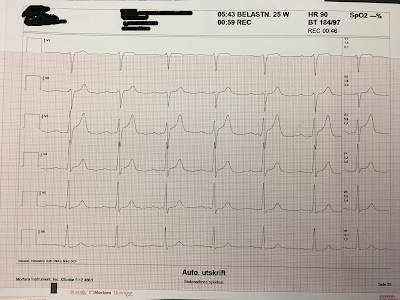 "I could not see any ECG sign that had me particularly worried. I thought for a moment that the T wave in V3 seemed just a tad "fat"." "Physical Exam was unremakable. With a hx of ongoing chest pain for many hours with no pain free periods my concern for ischemia was dampened when the high sensitivity troponin T returned at 10 (ref value 0-14 ng/L)." 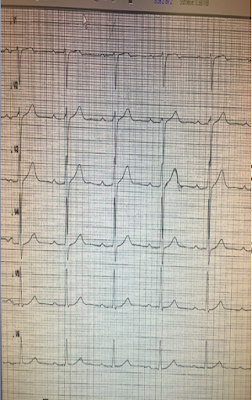 Repeat ECG (2, not shown) 30 min after first ED ECG was also without change dynamic change. "I admitted him for observation. He was put on telemetry. The second troponin drawn 6 hrs later also 10 ng/L. He had no further episodes of CP. Telemetry without arrhythmia/ST-T changes. Next day, the patient was pain free." "Due to worrisome symptoms, I went forth with stress test." ECG 3 was recorded just before the stress test and was not significantly different. You need to press the play, but there is no arrow. There is no change during this short timespan. This ECG video starts 4 minutes into the stress test. Pay attention to leads V3 and V4. The entire video is 90 seconds, but you can speed ahead. 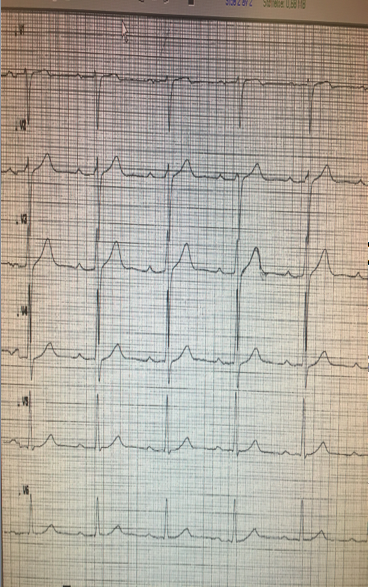 "The presenting ECG was without any obvious (at least to me) ischemic findings. The hs TnT was normal, even at 6 hours. But the stress test had impressive ST-elevation with rapid resolution. It is uncertain why he had no symptoms during the stress test; perhaps due to short duration of demand ischemia?" "I cannot however explain ongoing symptoms for many hours prior to admission with normal high sensitivity troponin. Maybe enough blood flow as to not result in irreversible damage to myocytes?" "Since the findings during stress test quickly resolved during rest, I felt quite confident angiography would reveal severe fixed proximal LAD stenosis, but I was not particularly worried about ruptured plaque." Comment: I (Smith) would be worried about ruptured plaque because the patient had presented to the ED with chest pain that was induced only by mild exertion and had also been present at rest. 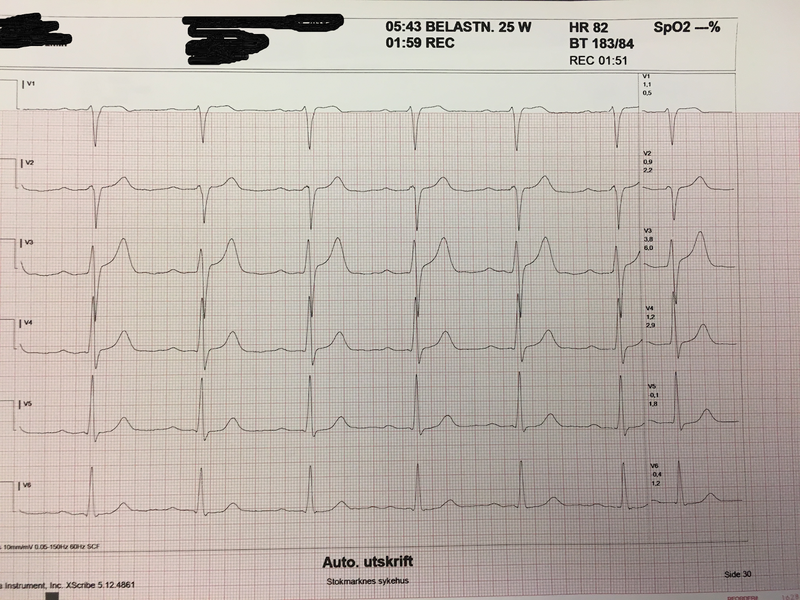 "The patient was transferred to PCI-capable hospital same day. Troponin T after transfer was 16 ng/L. I thought they would find proximal LAD stenosis. They found severe mid-LAD stenosis distal to D2. The patient did well. Maximum trop was 69 ng/L after stent placement." You can see the tight stenosis that is stented. It is wide open after intervention. Notice the stent itself before contrast is injected. High sensitivity troponin: All of the studies of high sensitivity troponin (hs-cTn), whether of hs-cTnI or of hs-cTnT, have false negatives. While negative predictive values for many combinations of either initial hs-cTn below the level of detection, or below some other very low value, or of 0 and -1, or -2, or -3 hour serial protocols, can exceed 99%, the sensitivity for MI rarely exceeds this threshold. Moreover, with any combination of hs-cTn values, neither the NPV nor sensitivity exceeds 99% for 30-day adverse events (which includes unstable angina, MI within 30 days, coronary intervention, and more). This is why we must always put high sensitivity troponin results into context. Those with red flags (very worrisome history) must be taken seriously even when their hs-cTn protocol is negative. The only protocols which reach greater than 99% sensitivity for 30-day adverse events use an accelerated diagnostic protocol which requires use of a risk score such as HEART or EDACS, in combination with a non-ischemic ECG and a single very low hs cTn or serial cTn below various thresholds and with a minimal increase. All protocols also rely on adequate follow-up. Furthermore, stress testing may still be useful in selected patients. There are patients whom you are worried about and even if all the objective criteria are negative, they may still have ACS and it may be revealed with a stress test. It is true that you must do them judiciously so that you don't have too many false positives. In this case, there were 2 hs-cTnT that were 6 hours apart and both were 10 ng/L. That is even more reliable than a 0/1 hour protocol. You can see the NPV for MI is 99.8%, and sensitivity 99.3%. But the sensitivity for ACS or for 30-day adverse events is not that high. Mokhtari et al. found this protocol to be only 87% sensitive for ACS! 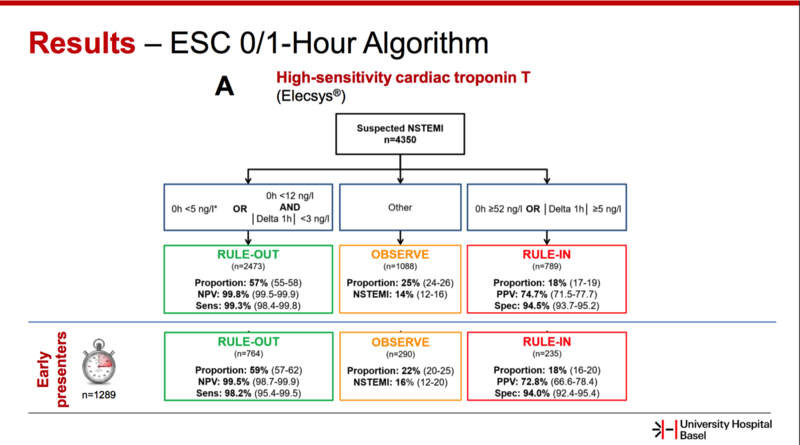 However, in an extended protocol in which they only allowed patients without high risk history and with non-ischemic ECGs to be considered "negative," the sensitivity was 97.5% for ACS. Mokhtari A. et al. A 1-h combination algorithm allows fast rule-out and rule-in of major adverse cardiac events. JACC 2016;67:1531-40. 2. There is still value to further testing after negative troponins, with careful patient selection.